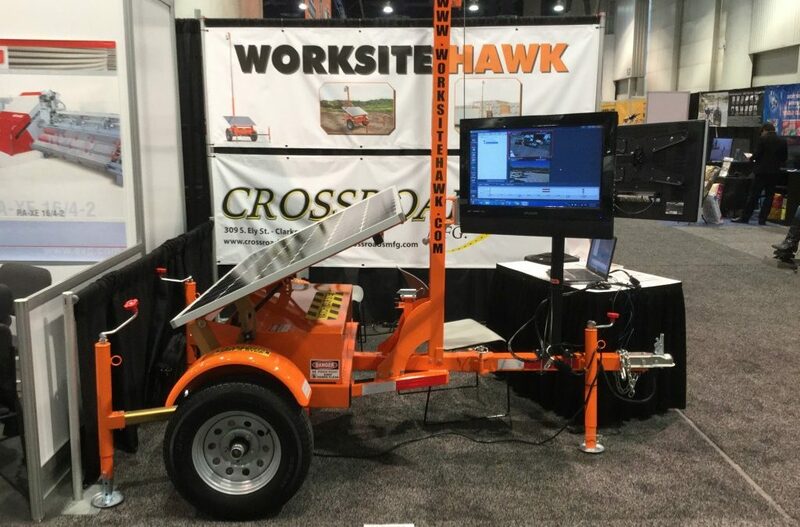 The Worksite Hawk: Wowing the Industry at World of Concrete 2015! It was with great excitement that we at Crossroads Mfg. were able to demonstrate the remarkable Worksite Hawk at World of Concrete 2015. Our expectations were high, but the experience met and surpassed them, making the convention one we’ll never forget! Held in Las Vegas, Nevada, World of Concrete is a premier event for those in the construction industry. Industry leaders and professionals from six continents converge at one place to check out the newest technologies, browse the best equipment, and learn useful information concerning their field. Even with so much going on, the Worksite Hawk was a standout. Over the course of four days, we were delighted to share our enthusiasm for the Worksite Hawk with hundreds of visitors, coming from every state and nations ranging from the United Kingdom to South Korea to Libya. We answered countless questions and enjoyed every opportunity to demonstrate the Worksite Hawk’s many great features. It quickly became clear to us that the Worksite Hawk offers something special that can’t be found with any other product; top-notch security and management at an unbeatable price. We left World of Concrete 2015 empty handed, but in a good way, as one lucky customer purchased our demonstration unit! Things couldn’t have gone better for us this year, and we can hardly wait to see old friends and make some new ones at World of Concrete 2016! Easy Setup –A few simple steps and the Workplace Hawk is ready to go. Learn more about the Worksite Hawk by calling 319-415-1226, or email us at sales@CrossroadsMfg.com.